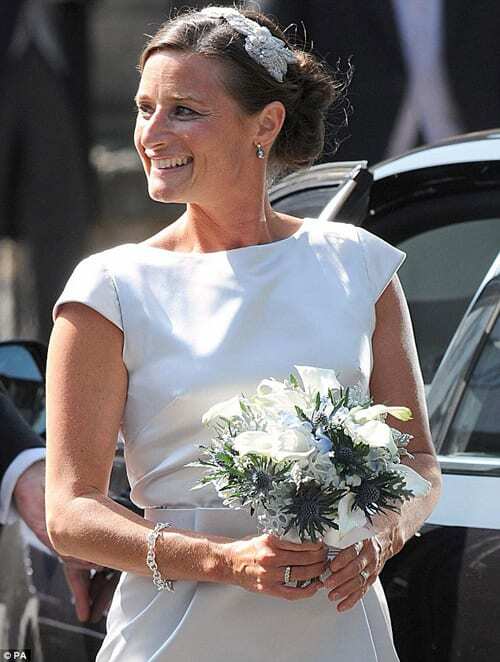 Zara Phillips's bridal bouquet...what did you think? Although a private wedding, there was still a lot of public interest in Zara Phillips and Mike Tindall’s wedding which took place today. And of course, I was interested in her bridal bouquet! It was made by London-based florist, Paul Thomas, and included white calla lilies (Zantedeschia), sea holly also known as alpine thistles (Eryngium) and Dusty Miller (Senecio) foliage. Being half-Scottish, I was delighted to see that Zara had decided to include thistles, the national emblem of Scotland. And her Maid of Honour and bridesmaids carried smaller versions of her bouquet. This is not the first time that florist, Paul Thomas, has worked with the royal family. In 2000, he was invited to design key decorations for the celebration of HM Queen The Queen Mother’s 100th Birthday at Windsor Castle, decorating St Georges Hall with two magnificent displays. He was subsequently asked to decorate for the 21st birthday celebrations of both Peter and Zara Phillips. Then, he was honoured to be invited to decorate St. George’s Hall for the wedding reception of HRH the Prince of Wales and The Duchess of Cornwall. And in 2008, Paul was personally invited by Peter Phillips to design and decorate the wedding reception at Frogmore House at his marriage to Autumn Kelly. I think Zara’s hand-tied bouquet is so apt for her Scottish wedding. I’d love to know what you think? Very pretty indeed. I’m not a big fan of lilies, or white – but the thistles add a lovely twist of colour and tie in wonderfully with the Scottish connection. Hi Jan. The whole bouquet is totally ‘spot-on’ for the occasion and location, isn’t it :-). Sorry, guys, not thistles but but sea holly (Eryngium maritimum of the family Umbelliferae) and NOT the thistle (family Asteraceae)! I suppose it’s a personal preference but I was disappointed in the bouquet. I thought it was a little too achromatic for a high summer wedding also not keen on aroids of any description. Which flowers and colours would you have liked to have seen? Lily of the Valley I saw too -in July! Lovely bouquet! It certainly upstaged the one Catherine chose for her wedding, which was too small and badly tied at the back. Paul Thomas did a wonderful job. Hi Jane. I totally agree…Paul did a wonderful job. I thought the bouquet truly reflected Zara’s personality. I thought Zara’s wedding bouquet was beautiful. Someday I want my funeral Casket spray to have much the same flowers with perhaps a touch of pink or red depending on the season. Thank you Shelley for your comment :-). Sorry but it wasn’t for me. As other posters have said, perhaps for a frosty winter wedding instead? The boquet was chunky and in my view, too big for a hand tied boquet – not very elegant. But then I wasn’t a big fan of the dress either (chunky, not very elegant). Sorry to sound like a killjoy – as long as she liked it! That’s ok Bonnie :-). It’s lovely to see all the varying opinions on Zara’s bouquet…they’re all valid. Very original and beautiful in such pale tones. It plays off Zara’s amazing blonde coloring! I love that the bridesmaid’s match Zara’s without the lily of the valley, reserved for the bride! We love it ! It is called Super Nova in Glendora, California. It is so trendy, we designed prom and homecoming corsages. The generation of young ladies appreciate its unique and elegant look.